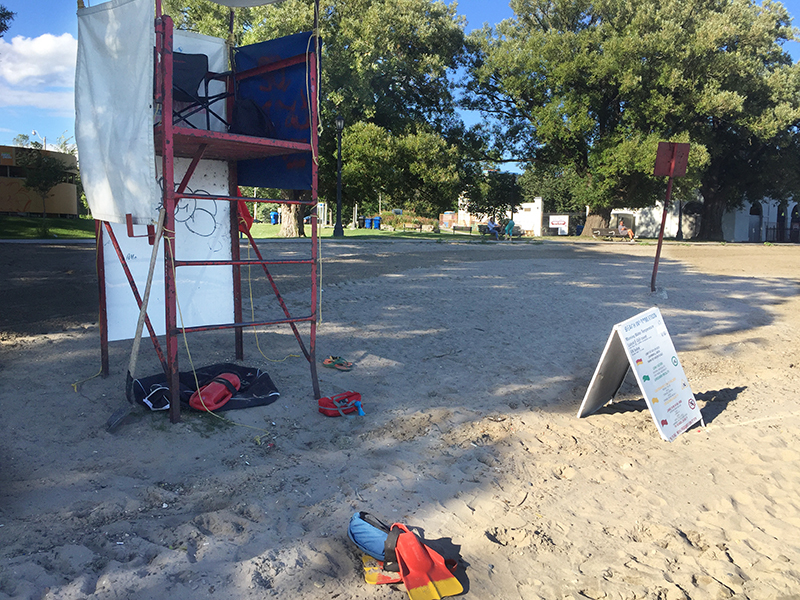 Sunnyside is a beautiful old-fashioned urban beach, with a great historic bath pavilion and a sandy beach. The waters are calm and warm because of the breakwaters enclosing it. The placid water attracts rowers who practice there. The warmth and stillness means it tends to weediness as you go deeper. Being close to the mouth of the Humber it more often has water quality issues. Without the crash of breaking waves, the soundtrack of the beach is an odd and somehow soothing hum that is half crickets and half the traffic of the Gardiner Expressway. This is another sandy beach which becomes pebbly at the waterline, in this case mixed with green globs of plant life residue. The early morning temp was 18, according to the posted sign. Felt quite warm to our feet, but that’s all that we immersed. Water looks clear right at the edge, but darker as it deepens, which may indicate weeds. Because it was a red flag day, E coli count of 207ppm, we did not swim and so cannot say for sure. Although there was equipment on the beach which we took as evidence of lifeguard presence, there were none to be seen and therefore none to annoy us. The beach pavilion dominates the beach, and the wide arms of the bay feature the Toronto skyline and CN Tower to the east, and the Mississauga skyline to the west. Beyond the breakwater is open blue water to the horizon, sprinkled with a few mandatory sailboats, of course. Not a dog in sight. In fact, the only creatures we encountered were a man relaxing on a bench in the shade, and a monarch butterfly perched on the sunflowers.